I am obsessing over all things pumpkin. How about you? These no bake pumpkin pie cookies cookies are no exception. They are so good. My picky 4 year old loved them and she claims to hate pumpkin. Lol. These no bake pumpkin pie cookies can be made in minutes with almost no dishes to do after. This is a super easy recipe you can make with your kids. 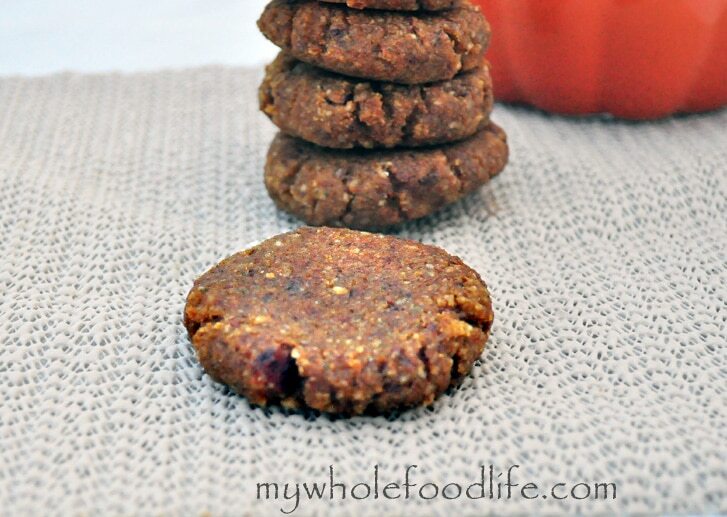 These pumpkin cookies are vegan, gluten free and paleo. Can it get better? I hope you enjoy them as much as we did. In the food processor , grind up the almonds, pecans, pepitas and spices. Then add in the dates and continue to pulse. Lastly add in the pumpkin and pulse until a dough starts to form. When the dough is formed, roll into balls and stick in the fridge for 30-60 minutes to firm up. I rolled mine into balls and flattened then with my palm once they had firmed up. It’s an easy recipe to do with your kids. I got about 10-12 balls out of my batch. Store them in the fridge or even freeze them for longer storage. Enjoy! Btw, your daughter, Meadow from the videos is so adoreable! Do you have chia seeds or sunflower seeds? You can probably sub those. These are delicious! Not sure about the dates I opened tonight, they have been in my pantry unopened for about 6 months or so. They are Medjool, pitted dates, which I have never bought in the past. They usually have pits. Anyway, upon inspection they look a little strange in that there seems to be some lighter brown seeping stuff around some of them. My husband things they may be molding but I have seen molding dates before and they looked greenish and grey and fuzzy. I was wondering because they are pitted maybe they got squished and that is the inside seeping out. Any thoughts? It's probably too late now, since I'm sure you've either tossed them or used them, but I don't think they are bad. That brown goo is just the date syrup oozing out. That happens, depending on how fresh they are and the weather or moisture content of the air. We have a vendor at our local farmer's market who sells dates from her brother's farm in So. Cal. She says she scrapes the brown stuff off of the dates when they ooze and uses that for syrup. If they smell fermented, on the other hand, that's a different story. I do not have pumpkin seeds. Do you think it would make a big difference if I was to omit them? Can you replace them with a few more nuts? Thank you for all your wonderful recipes! My health thanks you! You are so welcome Marla! LOVED these. Huge hit with the kids. Much sweeter once they had been chilled in the fridge for about an hour. Hi there! I am trying to find a recipe to use for cookies that I can use a pumpkin shaped cookie cutter I got for treats at my daughters Halloween party this Thursday...would these hold a shape? If not, any suggestions? 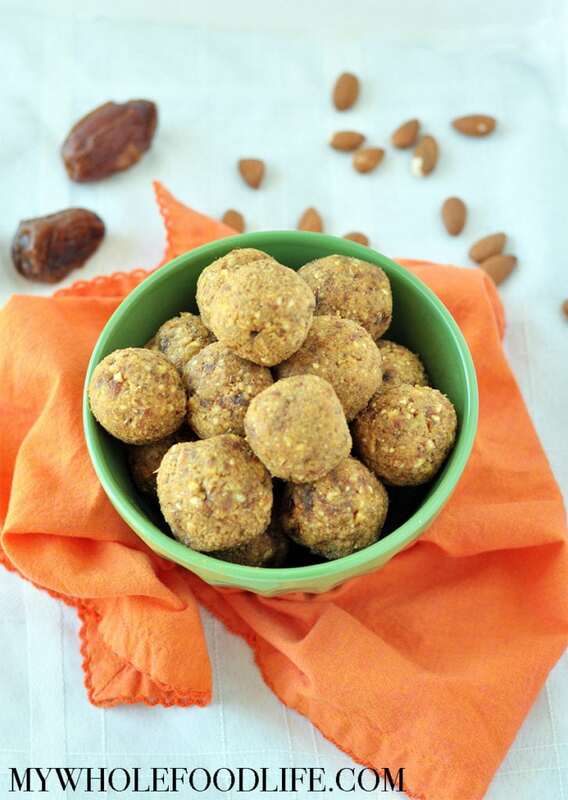 I am trying to do all of the treats very healthy and definitely very low sugar! I'm not sure if this one would work. The dough is too sticky to roll out. :( I am not sure of a recipe that would work with a cookie cutter. I'm sorry I couldn't help more! They look yummy and healthy but my oven is down, I can't roast the pumpkin. My son is allergic to walnuts, pecans and hazel nuts. What can I substitute with?